Loyd Dale Cates, 86, of Havana, died Friday, July 6, 2018 at Arkansas Hospice River Valley Home in Russellville. The son of Alfred and Lola Jewel McGuran Cates. He was born April 6, 1932 in Belleville. He was a United States Navy Veteran of Korea and Vietnam. He was a Petty Officer First Class with U.S. Navy. 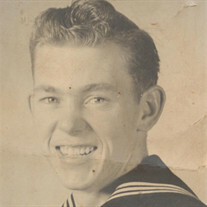 Loyd was a devoted husband, father and grandfather. He was a member of the Masonic Lodge and the Delaware V.F.W. post 8383. He enjoyed fishing, playing guitar, trips to the casino and spending time with family and friends. He was preceded in death by his wife Evelyn Maddox Cates; his parents and two brothers Robert Glen Cates Sr. and Alfred Hayden Cates. Survivors include seven daughters: Linda Wilson (Butch) of Belleville; Tara Pace (Larry) of Rover; Teresa Miller (Scott) of Rogers; Diane Burdess (Steve) of Snow Lake; Dale Martin (Dicky) of Augsburg; Tina Cogburn (John) of Arab, AL; Jackie Moore (David) of Russellville; a son Loyd Joe Cates (Twanna) of Havana; 15 grandchildren; 28 great grandchildren and 4 great, great grandchildren. Funeral Service will be held at 3:00 PM, Monday, July 9, 2018 at Humphrey Chapel. David Moore will officiate. Burial will be at Russell Cemetery in Belleville by Humphrey Funeral Service. Visitation will be 2:00 - 3:00 pm, on Monday, at the funeral home. Internet obituary and on-line guest book are available at www.humphreyfuneral.com.